I’m Iris, and I used to blog over at From Alevin to Adult. An alevin is a newly-hatched salmon and, as you might guess, my current research is fairly salmon-centric. I’m studying factors that influence estuarine and early marine growth of salmon, and how growth links to overall survival. Salmon are anadromous, meaning that they move between freshwater and saltwater at different stages of their lifecycle and, as such, they depend on a variety of habitats. Furthermore, salmon are often subject to intense size-selective mortality – meaning that a fish’s growth can determine whether or not it survives. Several studies have shown that the time spent and size gained in estuarine and early marine environments affect overall survival for salmon. Growth is largely determined by feeding success, and faster early marine growth has been associated with higher marine survival for salmon. So, what could influence salmon feeding in these early life stages? Surely what they’re eating might play a role – where is their food, and how much food is there? Most juvenile salmon eat primarily zooplankton in these early life stages and switch to a fish-based diet as they grow. Environmental stressors may affect feeding. High temperature and low-oxygen waters can be inhospitable to salmon. This can physiologically affect the fish so that it does not get as much net energy from its prey, or it can prevent the fish from reaching its prey altogether. Finally, interactions with other fish may have a large effect on feeding. Juvenile salmon are tasty. They are often targeted by larger fish and, to avoid this, they may have to adjust their feeding behavior. Additionally, juvenile salmon aren’t the only small fish out there. 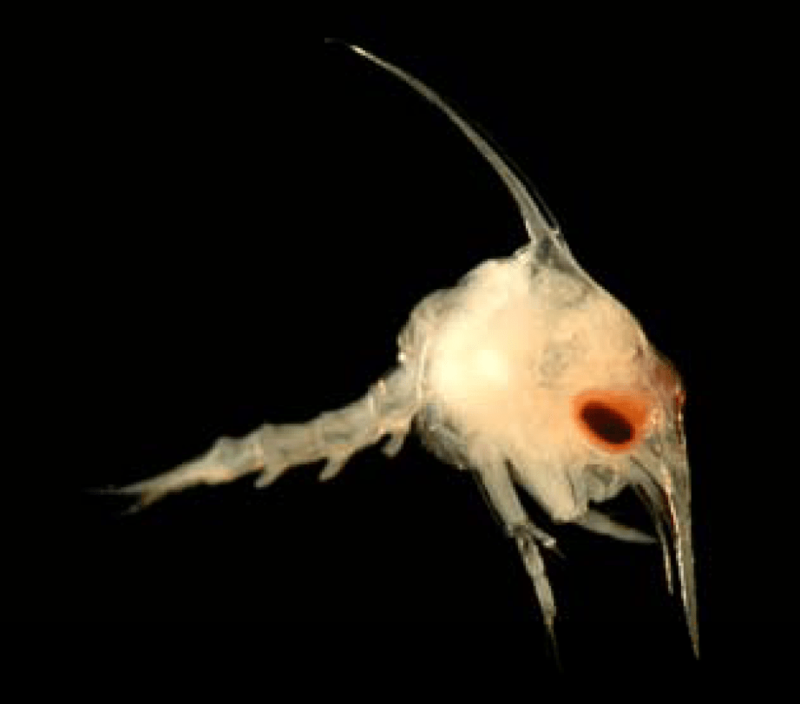 Other planktivores (fish that eat zooplankton) might compete with salmon for food resources. Competition among salmon species and other forage fishes has been linked to reduced growth, likely because it limits food availability. Pacific herring eat many of the same prey types as juvenile salmon. In Puget Sound, where I work, juvenile Chinook salmon spend a period of months feeding in the estuary before they head out to the ocean. Fish that are bigger after this period are more likely to survive to adulthood. The variability in growth is affected by diet, especially for some key prey taxa, like crab larvae and insects. Feeding rate (a surrogate for food availability) is highly variable, which suggests some amount of food limitation. What my work explores is whether there is potential for competition between salmon species and Pacific herring in offshore environments of Puget Sound. In order for competition to occur, the fish need to be in the same place, at the same time, using the same resources (for example, prey) – and at least one resource must be limiting. I use midwater trawl data and hydroacoustic surveys to determine where the fish are during the summer, I do lots of gut analysis to find out what they are eating, and I use bioenergetics models to quantify feeding rate and consumption demand for each species. Interesting, right? But why Puget Sound? Why Chinook salmon? 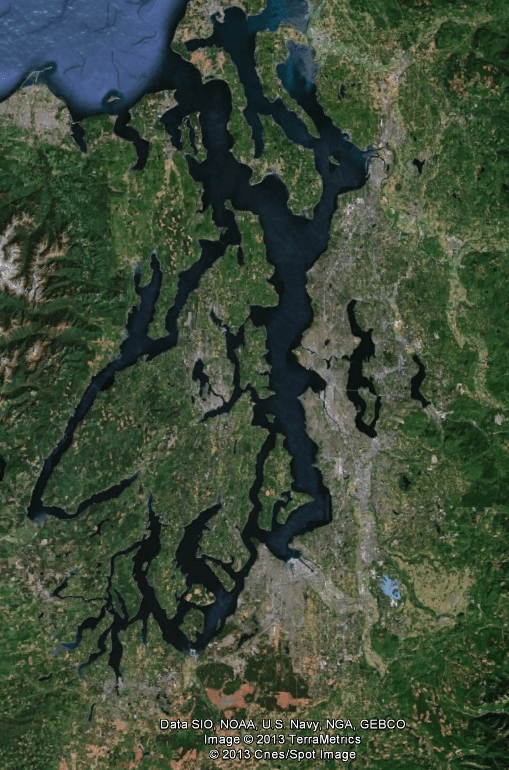 Puget Sound is the second-largest estuary in the U.S. and plays an important economic, recreational, and ecological role in the Pacific Northwest. Puget Sound Chinook salmon have shown a pattern of declines in survival since the 1980s. At least half of Puget Sound Chinook populations are influenced by hatcheries, and hatchery Chinook smolt-to-adult survival has been around 1% in recent years. That means that for every 100 young salmon that leave the river, only 1 returns to spawn. Figure from Duffy & Beauchamp 2011. 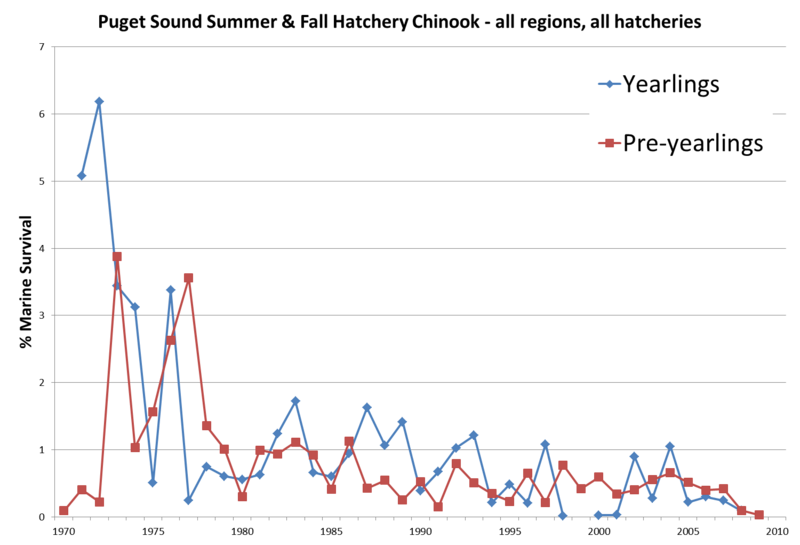 Average marine survival of Puget Sound hatchery Chinook salmon. Survival data are from the Regional Mark Information System database (available via rmpc.org) and expressed as percentage survival. The number of groups included in each year is listed at top, and error bars represent +/- 1 standard error. Puget Sound Chinook salmon are currently listed as threatened under the Endangered Species Act. Chinook salmon are the most dependent of all salmon species on estuarine environments and have a history of extensive use of nearshore and offshore habitats in Puget Sound. The continued poor performance of Chinook populations may reflect estuarine issues in Puget Sound – for example, degraded rearing conditions due to habitat loss, reduced prey abundance, reduced prey quality, pollutant levels, etc. Reducing early marine mortality could be an effective way to stabilize shrinking populations: therefore, assessing factors that affect growth and survival is much needed. Of course, though my graduate work contributes towards defining and addressing the issues facing Puget Sound Chinook salmon, it is only one piece of the puzzle. When I’m not at school, I am a research assistant for the Salish Sea Marine Survival research initiative. The project is a collaboration between a fairly comprehensive group of US and Canadian scientists, and asks, on a very broad level, what is driving ecosystem-wide salmon declines in Puget Sound and the Strait of Georgia? I love this work because it encourages collaboration and a broad perspective on the issue: our collective research areas range from physical oceanography to marine mammal tracking. I strongly believe that a comprehensive view of the Puget Sound ecosystem is necessary to address the ecological issues it faces, and that a single-species approach is not effective. So. That’s me. I admit that I have fallen into something of a love affair with salmon, but my overarching research interest is in species interactions – for example, predator-prey dynamics and competition. I’m fascinated by the linkages between groups in an ecosystem, and particularly in how these linkages operate in the context of the entire ecosystem. Most recently, I’ve been ruminating about ecosystem-based management needs and implications, and the role of science and scientific advocacy in the public discourse. I very much look forward to discussing these and other topics with you. 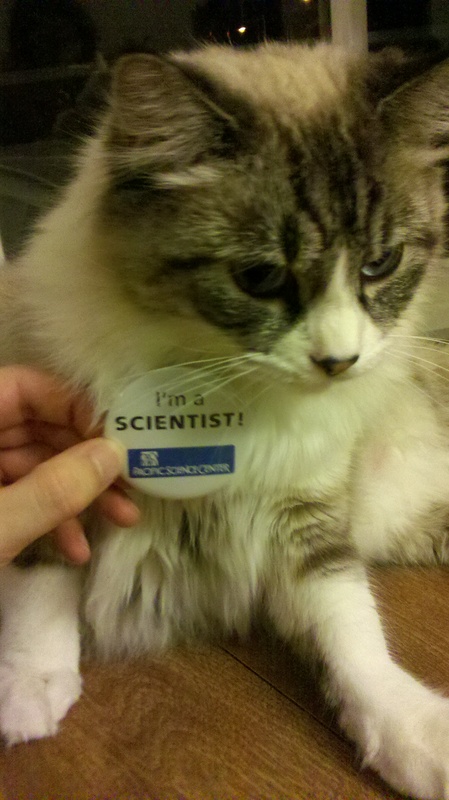 Gratuitious fluff: my cat also has scientific aspirations. Happy early Caturday! From Beamish 2011. 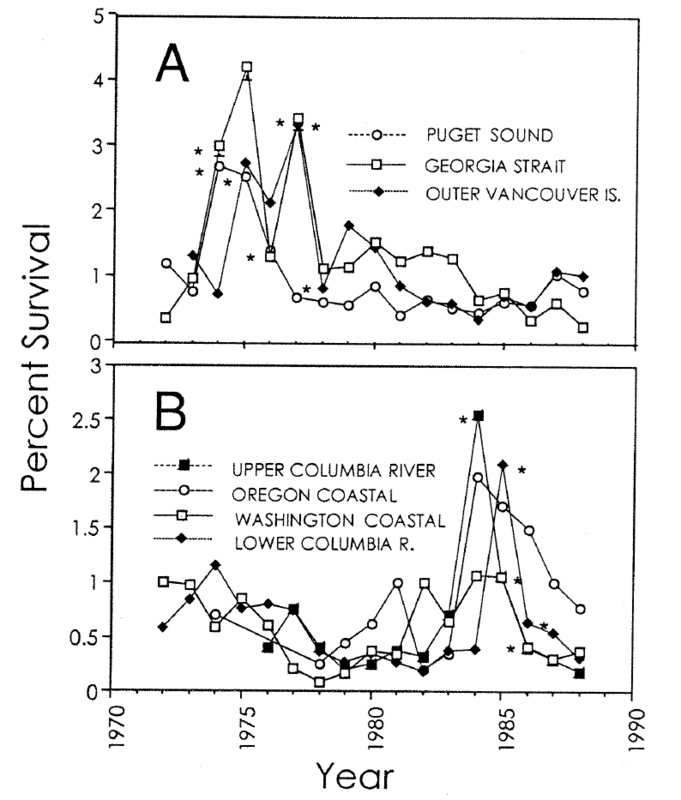 Survival trends for Puget Sound and Strait of Georgia Chinook salmon. 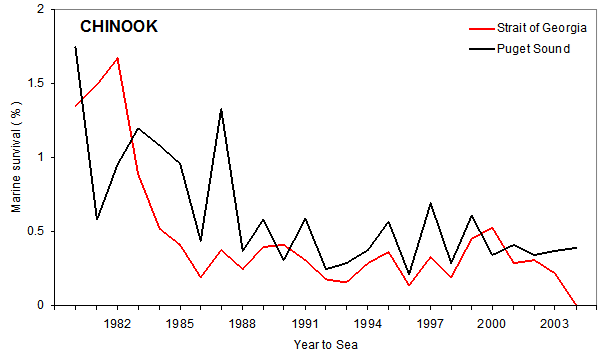 Average marine survival for Puget Sound hatchery Chinook stocks. These data are available from the RMIS database (rmpc.org). Note that yearling Chinook are released after a longer hold time and at a larger size. From Mahnken et al. 1998. These panels illustrate different survival responses among areas. Nice article. It really defines your interests and shows your enthusiasm. You write very well. But… You state that survival of Chinook salmon has decreased since the 1980s, but present a graph that shows no decrease. There was a spike in the mid-70’s, but excluding that, there is no evident trend, save perhaps an increase in survival in recent years. Is Beel missing something? That’s an excellent question. I like that graph because it shows nicely the current low-survival state and also the variability within that state (from around 0.1% to 1% marine survival). But you are correct that it doesn’t show a long term decline very well. And, admittedly, issues of salmon survival and salmon abundance are much more complex than a single blog post. Before I get into a salmon rant, just a quick note: that graph reflects hatchery Chinook salmon survival. 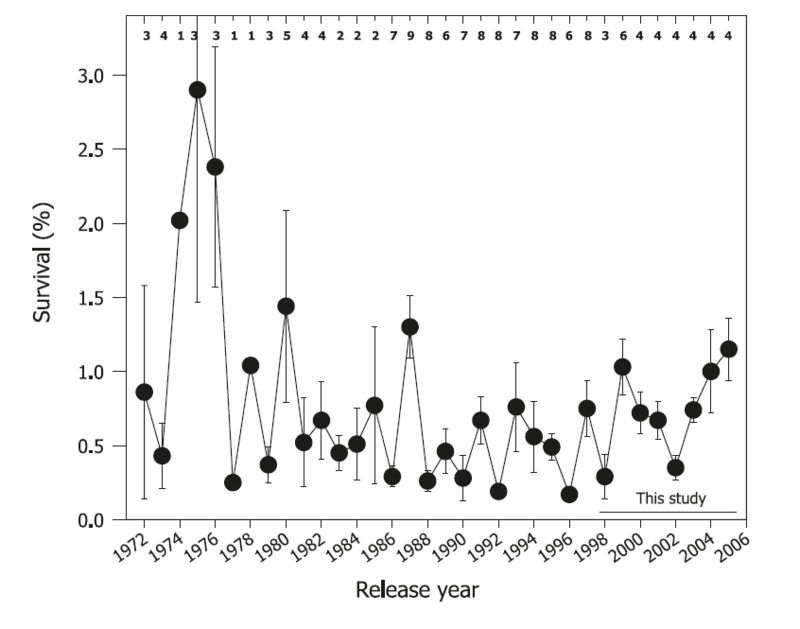 It’s debatable whether hatchery Chinook population trends actually represent wild Chinook population trends. However, hatchery salmon trends are commonly used because they are much easier to measure than wild salmon. Very little data exist on wild Chinook abundance patterns in Puget Sound. At least half of the populations are supplemented or influenced by hatcheries. But that’s a whole ‘nother discussion altogether. Let’s proceed to the salmon rant. Traditional ecological knowledge (TEK) from the local tribes suggests significant declines in salmon populations in relation to historical levels, though to my knowledge there has been little-to-no quantification of TEK regarding Puget Sound. In the Pacific Northwest as a whole, geological and zooarchaeological evidence point to a long history of salmon usage by humans – but post-European settlement, this salmon usage quickly became unsustainable. (As an aside, I just saw a lecture on the sustainability of aboriginal salmon use in the Pacific Northwest. It’s online; you can check it out at http://goo.gl/uQ9gU.) The survival patterns I’ve mentioned are within the context of a longer declining abundance trend. Salmon abundance varies naturally. Archaeological evidence shows historical trends in abundance that correlate with large-scale climate variability. On a shorter time scale (20-30 years), the Pacific Decadal Oscillation corresponds to salmon abundance in the North Pacific. It’s widely accepted within the salmon community here that the declines in survival in the late ’70s-’80s were a response to a regime shift in 1976 – from good ocean conditions for salmon to poor ocean conditions for salmon. However, we have been in a “good” regime since about 2000 and marine survival for Puget Sound stocks has not improved as expected. The thing that really has all of us scratching our heads is that the Salish Sea salmon populations have responded differently than coastal salmon populations. Is the current state of low-survival simply part of a larger oscillatory cycle? I don’t know. Can we expect Puget Sound Chinook salmon to recover to a non-threatened state without doing anything? Again, I don’t know for sure, but I suspect it’s unlikely. I don’t think comment format allows for inclusion graphics, but I’ll put a short addendum to the post with a couple of other trend graphs (though unfortunately none of the graphs I have at hand show survival trends prior to 1970). I doubt that you could have picked a more interesting subject. Thank you for taking time to provide such a detailed answer. It is very informative. You’re welcome! There are still many questions about salmon in the Pacific Northwest, and a lot of great research going on. The story is definitely not black and white. If you’re interested in the topic, there are two really well-done books that I would recommend. First, Salmon Without Rivers: a history of the Pacific salmon crisis, by Jim Lichatowich. This is actually the first book that I read after arriving at UW (back when I was newly arrived from the South and didn’t know the first thing about salmon) and it is one of the classics. Second, King of Fish: the thousand-year run of salmon, by David Montgomery. This book came out in 2003 and traces the issues faced by Pacific salmon in comparison to Atlantic salmon (which have been all but extirpated), as well as the complex politics surrounding Pacific salmon. Very informative and revealing report! Thanks Iris. This information is sobering to say the least. I had no idea that the survival rates were *so* low. Thanks, Chris! These data are averages across the whole of Puget Sound. There is variation among stocks; some stocks are doing better/worse than others. The issue isn’t limited to Chinook salmon either – marine survival rates have shown a general decline for coho salmon and steelhead in the Salish Sea as well. (Puget Sound steelhead were listed as threatened under the ESA in 2007. Puget Sound coho are a species of concern, but to my knowledge are not listed.) Because of these similar patterns, many of us suspect there is some common driver or, more likely, set of drivers at play.